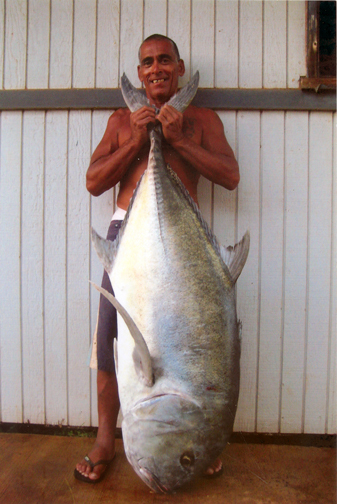 Thomas Moreno of Waimea made the catch of his shorecasting career on June 7, 2013. He used a 13-foot Nitro pole mated to a Daiwa Sealine 400H reel loaded with 50-lb test Ande line to battle a rampaging 124-lb 5-oz ulua during a trip near Kekaha, Kauai. It was a historic catch!